Entertainment, a chance to get away from the everyday routine, socialising, rituals of going to the cinema and the experience of watching movies – those are the feelings that attract the audience to a modern multi-hall movie palace. The visual effect of the large screen and the Dolby SR sound in the closed cinema atmosphere provide an especially strong emotional impact on the audience. At the moment when the audience is in an emotionally stimulated state and has concentrated on the action on the screen (as there are no distracting factors), the audience is open for advertising and such advertising works both directly and on a subconscious level. Although the same advertising clips from the TV are played in the cinema, in the cinema environment the audience perceives the advertising in cinemas as more funny and more entertaining, it seems unseen in other media and it is evaluated as more attractive as well as more valuable and successful for products and brands. Large-screen advertising has a specific sensual impact therefore the effect is evident even at the first viewing. to transfer the positive associations from the character in the film to the brand image. It is possible to reach 90,000 spectators in Kino Citadele monthly. The dominating demographic groups of movie-goers are young and active consumers with disposable income. When the advertiser chooses the film and time of demonstration, it is possible to reach the target audience in both the demographic and taste and lifestyle sectors. It is possible to approach all types of audience in the cinema, but, contrary to other media, this is an option to reach, in a concentrated manner, audiences which are difficult to reach otherwise (ages 12-34): teenagers, young adult men (ages 18-24); parents together with their pre-school and younger school-age children. The movie palace offers placing advertising not only on the screen, but also vast opportunities for placing advertising throughout the premises of the movie palace. 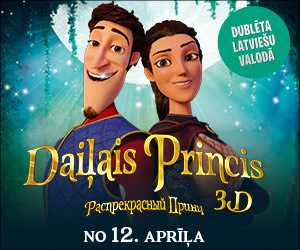 It is possible to demonstrate advertising in 3D format in the movie palace, too.